The only reason I’m using Carrot and paid for the subscription is simply for the Watch complication. I would recommend trying out a few, and see which weather apps meets your needs. I just don't want to start dropping a bunch of money on apps that I might not like. For 3.99 a pop I was trying to pick one or the other. So I was all set to try out Carrot after reading that it uses Dark Sky (the other paid app I was debating with it) and then I read the comment that Carrot doesn't give you a map unless you pay extra? If that's correct guess I'm going to give Dark Sky a shot. I'm only going to buy one or the other and play with it alongside WU and Storm for a bit to figure out which one to go with day to day. I did figure out WU is currently buggy on my iPad (5th Gen with 11.0.1). If I open it, then go to say the notifications then back the app refreshes itself and the toolbar stuff at the top disappears. The space is still there but no icons. Dark Sky is excellent when it comes to precipitation and notifying you when it’s about to rain, and that’s my primary reason for using it. Having said that, it lacks as an overall weather app, in my opinion. I prefer the layout of BeWeather 2 and it also excellent at reporting rainfall, thus the reason it’s my go-to weather app. Last edited by Just_Me_D; 09-28-2017 at 07:00 PM. Spencerdl and John Yester like this. What do you think it's lacking? Just curious because right now I can only go by the screenshots on the app store and it shows current day, forecast, weather maps, etc. Carrot shows the same kinds of stuff but it sounds like a lot of that is subscription only. I do still have BeWeather 2 just looking to try something different for a bit since it hasn't been updated in 9+ months. With Carrot, you need subscription for current, hourly, and Daily notifications or alerts. Also this is the only weather map that comes with the $3.99 app price. If you want more layers or whatever, you need the subscription, which is $3.49 per year. Update: The app price of Carrot just went up to $4.99. Last edited by Ledsteplin; 09-29-2017 at 12:04 PM. I'm still using Weather Underground, probably because it's what I was using when I was on Android and just kept using it when I switched to Apple. Yeah definitely going to give Dark Sky a try first. Found a recent YouTube video from August where someone bought and compared both. DS definitely seems more full featured vs. no subscription Carrot. 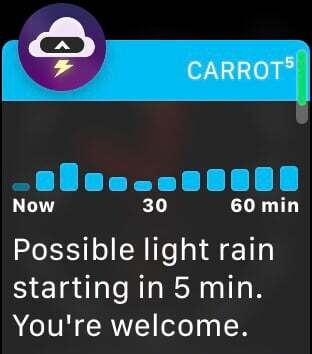 Apparently you need the subscription to get severe weather alerts on Carrot. Let me know how you like Dark Sky as I'm considering it as well. For some reason I still haven't found the perfect weather app but Storm is close. If I read that right, $4.99 for the app then another subscription for all features to work? What's the subscription cost? I just read it’s something like $0.50/mo or $2.50/yr. Sweet, thanks. I have no problems paying something like that for a year. No problem, Carrot and Dark Sky are both cheap yearly payments for premium. I’m pretty sure I paid for both. I have several Weather Apps. I caved and got Dark Sky about a month ago and it is phenomenal! I also use Storm (by Weather Underground), Weather Channel and a local tv news station’s weather app. Weather Hippie is amusing and BeWeather is nice but temperamental! Well I uninstalled all weather apps except for the stock weather app. On my watch is the only one that updates in real time without me having to open the app. I’d use the stock app, but I like receiving severe weather alerts, so I’m using Dark Sky instead. It stopped auto-updating on my Watch for a while, but seems to be working reliably now. Clearly you have the snark setting turned a few notches lower than I do! I can’t even post mine on the forum. Lee_Bo, ladyc0524 and Annie_8plus like this. Yep, saw that one. 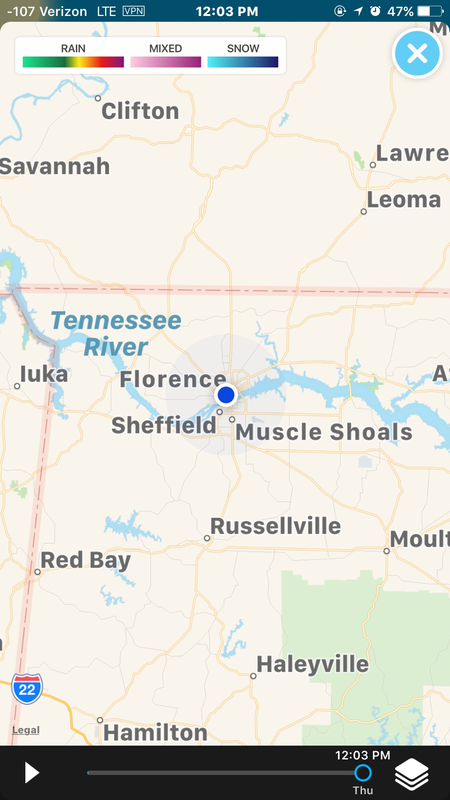 I think the reason I turned my town was because I'm keeping sound turned on more with my phone these days and didn't want a vulgar outburst fromy phone when at work. Haha! Yeah I keep the voice off in the app settings. BeWeather 2 - Because of its access to numerous personal weather stations, it is still the most accurate, in my opinion. 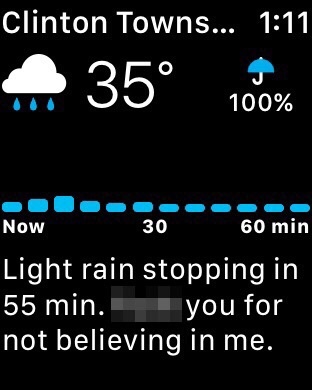 Dark Sky - The alerts and rain accuracy is still top notch and the layout is getting there.